Father’s Day is quickly approaching. Get him the gift he deserves. Get him a gift card to Black 13 Tattoo! Happy Father’s Day to real “Dads” everywhere. We know it’s hard to choose the perfect gift for the mysterious, emotionally distant man you owe your life to. Is a necktie or golf accessory truly a gift, or is it actually a mockery of everything your dad’s ever worked for? This June, get your dad what he really wants: a heavily tattooed son or daughter who he can respect and fear. 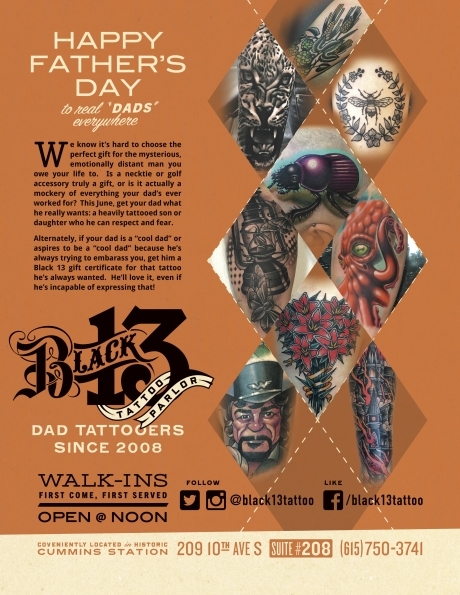 Alternately, if your dad is a “cool dad” or aspires to be a “cool dad” because he’s always trying to embarrass you, get him a Black 13 gift certificate for that tattoo he’s always wanted. He’ll love it, even if he’s incapable of expressing that! Black 13 Tattoo. Dad tattooers since 2008.